Today’s Collecta is at the Church of St. Vitus in “Macello Livice.” Station at the Church of St. Eusebius The assembly of the faithful was appointed for today at a church once called ad Lunam. During the Seventh Century, when St. Vitus was a popular Italian saint, this church received his name. Eusebius, whose house occupied the site of the stational church, was martyred under the Arian Emperor Constantius II (353-361). The nearness of an ancient burying-ground may have influenced the choice of the Epistle and Gospel of the Mass. 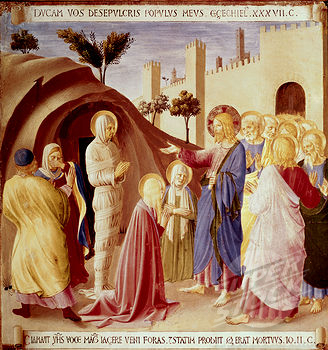 The resurrection of Lazarus may be regarded as a type of the sacrament of Penance. Jesus alone has power to convert the heart, but He delegates to his apostles and ministers the office of freeing Lazarus from the bands and the winding­sheet which envelop him. God, Who dost renew the world with ineffable sacraments, grant, we beseech Thee, that Thy Church may both be profited by the eternal institutions and not left without temporal assistance. Through Jesus Christ our Lord, Who liveth and reigneth with Thee in the unity of the Holy Ghost, one God Forever and ever. R.Amen. Lesson from the Book of Kings. In those days: The son of the woman of. the house fell sick, and the sickness was very grievous, so that there was no breath left in him. And she said to Elias: What have I to do with thee, thou man of God? art thou come to me that my iniquities should be remembered, and that thou shouldst kill my son? And Elias said to her: Give me thy son. And he took him out of her bosom, and carried him into the upper chamber where he abode, and laid him upon his own bed. And he cried to the Lord, and said: O Lord my God, hast Thou also afflicted the widow, with whom I am after a sort maintained, so as to kill her son? And he stretched, and measured himself upon the child three times, and cried to the Lord, and said: O Lord my God, let the soul of this child, I beseech Thee, return into his body. And the Lord heard the voice of Elias: and the soul of the child returned unto him, and he revived. And Elias took the child, and brought him down from the upper chamber to the house below, and delivered him to his mother, and said to her: Behold thy son liveth. And the woman said to Elias: Now, by this I know that thou art a man of God, and the word of the Lord in thy mouth is true. It is good to confide in the Lord, rather than to have confidence in man: V. It is good to trust in the Lord rather than to trust in princes. At that time, there was a certain man sick, named Lazarus, of Bethania, of the town of Mary and of Martha her sister. (And Mary was she that anointed the Lord with ointment, and wiped His feet with her hair; whose brother Lazarus was sick). His sisters therefore sent to Him, saying, Lord, behold he whom Thou lovest is sick. And Jesus hearing it said to them, “This sickness is not unto death, but for the glory of God, that the Son of God may be glorified by it.” Now, Jesus loved Martha, and her sister Mary, and Lazarus. When He had heard therefore that he was sick, He still remained in the same place two days. Then after that, He said to His disciples, “Let us go into Judea again.” The disciples say to Him, Rabbi, the Jews but now sought to stone Thee; and goest Thou thither again? Jesus answered, “Are there not twelve hours of the day? If a man walk in the day he stumbleth not, because he seeth the light of this world: but if he walk in the night he stumbleth, because the light is not in him.” These things He said, and after that He said to them, “Lazarus our friend sleepeth; but I go that I may awake him out of sleep.” His disciples therefore said, Lord, if he sleep he shall do well; but Jesus spoke of his death, and they thought that He spoke of the repose of sleep.Then therefore Jesus said to them plainly, “Lazarus is dead; and I am glad for your sakes that I was not there, that you may believe: but let us go to him.” Thomas therefore, who is called Didymus, said to his fellow-disciples, Let us also go that we may die with Him. Jesus therefore came, and found that he had been four days already in the grave. (Now Bethania was near Jerusalem, about fifteen furlongs off). And many of the Jews were come to Martha and Mary, to comfort them concerning their brother. Martha, therefore, as soon as she heard that Jesus was come, went to meet Him: but Mary sat at home. Martha therefore said to Jesus, Lord, if Thou hadst been here, my brother had not died. But now also I know that whatsoever Thou wilt ask of God, God will give it Thee. Jesus saith to her, Thy brother shall rise again. Martha saith to Him, I know that he shall rise again in the resurrection at the last day. Jesus said to her, I am the resurrection and the life: he that believeth in Me, although he be dead, shall live; and every one, that liveth and believeth in Me, shall not die forever. Believest thou this? She saith to Him, Yea, Lord, I have believed, that Thou are Christ, the Son of the living God, Who art come into this world. And when she had said these things she went, and called her sister Mary secretly, saying, The Master is come, and calleth for thee. She, as soon as she heard this, riseth quickly, and cometh to Him. For Jesus was not yet come into the town, but He was still in that place where Martha had met Him. The Jews therefore, who were with her in the house and comforted her, when they saw Mary that she rose up speedily, and went out, followed her, saying, She goeth to the grave to weep there. When Mary therefore was come where Jesus was, seeing Him, she fell down at His feet, and saith to Him, Lord, if Thou hadst been here, my brother had not died. Jesus therefore, when He saw, her weeping, and the Jews that were come with her, weeping, groaned in the spirit, and troubled Himself; and said, “where have you laid him?” They say to Him, Lord, come and see. And Jesus wept. The Jews therefore said, Behold how He loved him! But some of them said, Could not He that opened the eyes of the man born blind, have caused that this man should not die? Jesus therefore again groaning in Himself, cometh to the sepulchre. Now it was a cave: and a stone was laid over it. Jesus saith, “Take away the stone.” Martha, the sister of him that was dead, saith to Him, Lord, by this time he stinketh; for he is now of four days. Jesus saith to her, “Did not I say to thee that if thou believe, thou shalt see the glory of God?” They took therefore the stone away: and Jesus lifting up His eyes, said, “Father, I give Thee thanks that Thou hast heard Me; and I knew that Thou hearest Me always,but because of the people who stand about have I said it, that they may believe that Thou hast sent Me.” When He had said these things, He cried with a loud voice, Lazarus, come forth. And presently he that had been dead came forth, bound feet and hands with winding-bands, and his face was bound about with a napkin. Jesus said to them. “Loose him, and let him go.” Many therefore of the Jews who were come to Mary and Martha, and had seen the things that Jesus did, believed in Him. Thou wilt save the humble people, O Lord, and wilt bring down the eyes of the proud: for Who is God, but Thou, O Lord? May the gifts we offer purify us, O Lord, we pray, and continually appease Thee in our regard. Through our Lord Jesus Christ Thy Son. Who liveth and reigneth with Thee in the unity of the Holy Ghost, one God Forever and ever. R.Amen. The Lord seeing the sisters of Lazarus weeping at the tomb, wept before the Jews, and cried out, Lazarus, come forth: and he that had been dead four days came forth bound hands and feet. May the participation of this sacrament, we pray, O Lord, unceasingly keep us free from sins of our own and guard us from all hostile powers. Through our Lord Jesus Christ, Who livest and reignest, with God the Father, in the unity of the Holy Ghost, one God For ever and ever. R. Amen.